Home Strategies Are Retailers Wasting Their Time With Personalization? Are Retailers Wasting Their Time With Personalization? Personalized email campaigns generate 30% more revenue for many retailers, but only 3% are doing it successfully. Other surveys suggested that just a minority of marketers use personalization. Econsultancy’s latest CRO report found that 34% of companies aren’t using any form of personalization at all, in emails or on site. So why are marketers finding personalization hard to put into practice? Well, as Matt puts it, ‘it’s bloody hard’. Data. Marketers need relevant customer data to be able to put personalization into practice. In addition, the data has to be readily available to be used when needed. Content. You need the content to display in emails – to be able to show thousands of different products to different people depending on how you’d like to personalize the content for them. Combining these two things together in email on a regular basis can be very difficult. That’s just the start, as getting it right is another matter. For example, sending customers irrelevant product suggestions is likely to produce the opposite of the intended effect, so it’s important to get the execution right. There are challenges to companies attempting to collect data for personalization, from legal considerations to organisational issues. 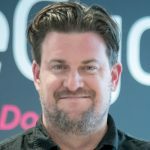 Segementation can look a little like personalization and, as Matt explains, this is the path taken by many marketers. This isn’t necessarily a bad tactic to use, as segmentation can be effective but it isn’t personalization as defined in the dictionary. This is because it isn’t targeted to the individual. The next tactic is using more personalization with some segmentation thrown in, but at a campaign level rather than on an ongoing basis. The use of campaigns generally happens because it’s a major undertaking in terms of resource and time. This can approach can still work well, but marketers are missing the opportunity to do this regularly in your normal email and lifecycle emails. Examples: Which Brands Are Using Personalization Effectively? Right from the first activation email, Lyft is personalizing the content using the information they have about the customer, location being the most obvious. These are sent every day for ten days at the end of the month to subscribers. Two different products are displayed along the same theme, with different product categories each time. Even though it’s a daily campaign, it’s fully automated and changes according to an individual’s propensity to purchase. Asda presses send on the email at the beginning of the ten day period, and just let it go. Every day the email and products contained within the email will change each day. 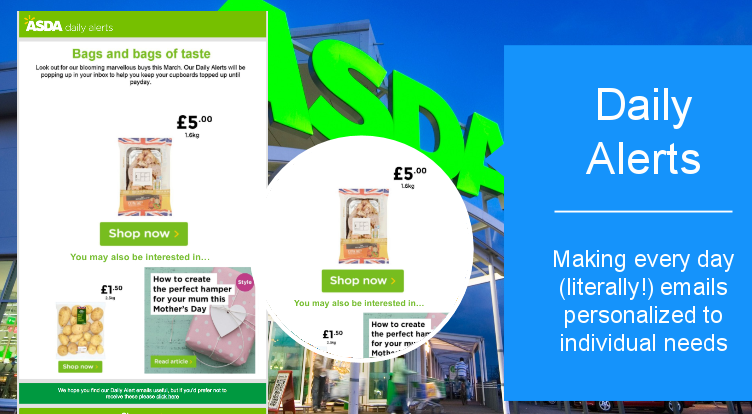 For Asda, this email performs well anyway, and the addition of extra personalization and automation increases its effectiveness. 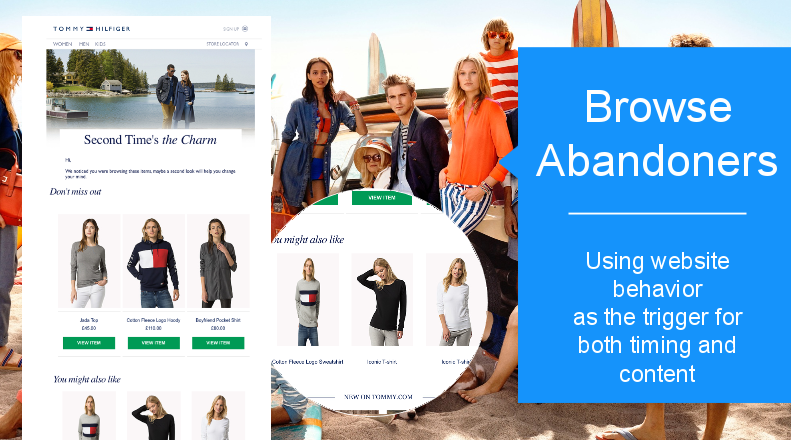 This email uses shoppers’ on-site browsing behaviour, so the customer receiving this email has looked at several products on the Tommy Hilfiger website. This email is sent 24 hours later, showing the browsed products, and recommendations based on other customer’s behaviour. Browse abandonment emails have an 80.9% higher open rate and 50.5% higher click through rate than traditional emails. Think bigger than segmentation. Are emails genuinely tailored to the individual? Try and use personalization repeatedly. For the best results, it should be part of business as usual, not just occasional campaigns. Consider the experience. It doesn’t have to be just about selling. Previous articleIs Choice Paralysis a Problem for Online Retailers? Next articleHow Can E-commerce Brands Improve Mobile Conversion Rates?